This is the ultimate of easy eats. Better yet, it is a great post-workout snack for the following reasons. 2. It’s extremely easily digested and knocks out PW jitters. 3. It has a great balance of fats, carbs, and protein. 5. Did I mention it was easy? -Yes, it has sugar. I am not a fan of many splenda/sugar free brands, plus we are talking post-workout. That being said, if you want a dairy and sugar-free pudding, try this pumpkin pudding – Pumpkin Pudding. -If you want a natural pudding, try Kozy Shack. They have all types and varieties. -This can be made low carb if so desired. Simply use a sugar-free alternative. 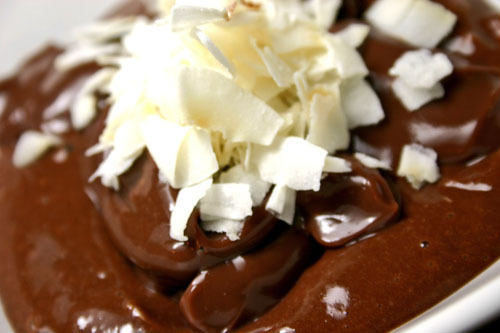 -Protein powders make puddings a little runny. If you want to beef up the texture, add a 1/8th tsp of xanthan gum and stir for 30 seconds to 1 minute. You can also re-chill after mixing. -For more texture, add nuts, dried fruit, etc. The sky is the limit. I like coconut flakes in mine. 1. Add, stir, done. 30 seconds. It is good. Take my word for it, it is good. Am I missing something? Where’s the actual recipe? Odd. I saw it in one browser, but not another. It is working in all browsers now. I think it copied over weird from word or maybe I am just a walking fail. Could be both. Leigh – you’re lightning fast! Thanks! BTW, I am using Google Chrome. Thanks for this idea – I think I’ll definitely be using this with some female clients who “need” their chocolate fix. Now, do I have to use a special peri-workout nutrition protein powder? What if I make the pudding myself instead of using packets? I am scared I can’t do this.